City of Malolos - Board Member Josef Andrew Mendoza was reelected as Philippine Councilors League (PCL)-Bulacan Chapter president during the recently held convention of all newly elected city and municipal councilors on August 1, 2016 at the Pavilion, Hiyas ng Bulacan Convention Center. This was called by the Depatment of Interior and Local Government almost two months after the May election to reorganize the League. After the closely contested election officiated by DILG Provincial Director Darwin David and the PCL National Directorate, Board Member Mendoza was elected for the second time paving the way for his second term as ex-officio member of the Sangguniang Panlalawigan. The new PCL officers for 2016-2019 are: President - Josef Andrew T. Mendoza (Bocaue); Vice-President - Marie Claudette P. Quimpo (Baliwag); Secretary - Arnaldo L. Mendoza (Paombong); Treasurer - David Michael DS. Ramirez (Meycauayan); Auditor - Irene Bonita Del Rosario (CSJDM); PRO - Gino Carlo Torres (Calumpit); Business Manager - Albert Estrella (Guiguinto); Board of Directors - Alma A. Gatchalian (Malolos), Christopher R. Baluyot (Hagonoy), Renato De Guzman, Jr. (Santa Maria), Froilan C. Caguiat (Santa Maria), Henry Marquez (Pandi), Wilfredo DC. Diaz (Marilao), Emmanuel T. Balicanta (Baliwag), Edwin De Guzman (Bustos). The PCL-Bulacan Chapter officers took their oath of office before Governor Wilhelmino M. Sy-Alvarado on September 5, 2016 in a simple ceremony held at the Governor’s Office. City of Malolos - Board Member Josef Andrew Mendoza was reelected as Philippine Councilors League (PCL)-Bulacan Chapter president during the recently held convention of all newly elected city and municipal councilors on August 1, 2016 at the Pavilion, Hiyas ng Bulacan Convention Center. This was called by the Depatment of Interior and Local Government almost two months after the May election to reorganize the League. 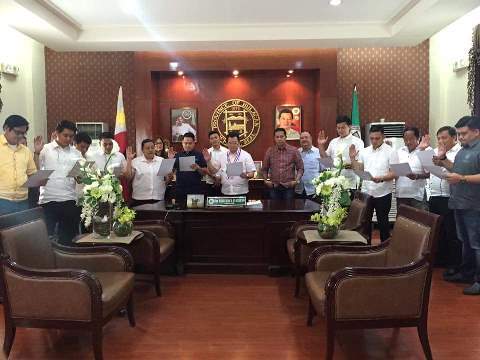 The PCL-Bulacan Chapter officers took their oath of office before Governor Wilhelmino M. Sy-Alvarado on September 5, 2016 in a simple ceremony held at the Governor’s Office.